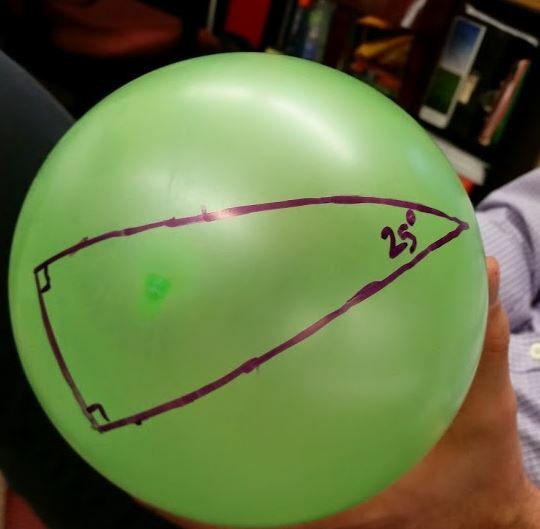 They even blew up balloons and drew triangles with two right angles on them (using protractors and rulers). But we said: assuming that you know that on a plane the sum of the interior angles of a triangle add up to 180 degrees, can you prove that quadrilaterals have a sum of 360 degrees for their interior angles. And each group was able to latch onto the idea of dissection without me saying anything… breaking the quadrilateral into two triangles. One group had someone who figured it out right away, but the others took a good amount of time trying to figure out where this argument failed. I loved it because it really showed them a misconception they had. Oh man, Sam – this is BEAUTIFUL! I want to BE in your Geometry class, and then go teach it to my kiddies and make them crazy! I love it – “did we break math?”. Did any of the kids try putting the angles together (you know, the old tear-the-angles-off-and-align-them-to-a-straight-line proof for the Triangle Sum Theorem)? (BTW – good think it was cold out this week, or you know what else would have happened with those balloons….) Keep writing! Oh Wendy, thanks. I pretty much think the same of you. As for the putting the angles together trick, we did that together and they taped the straight angle they created in their packet. I’ve never understood the obsession math teachers have with interior angles. 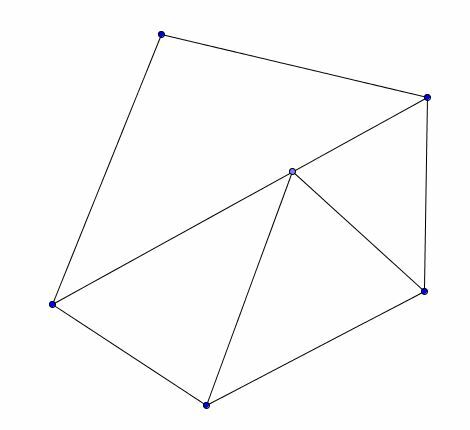 Exterior angles behave so much more nicely, and are actually useful when talking about turns of turtle following the path. Interior angles of a triangle: take a pencil, lay it along one edge, middle at the vertex. push it along the edge til the middle is on the next vertex. rotate the pencil through the interior angle. repeat for each of the next two sides. where is the pencil pointing now? what angle did it turn through? done! The amount you rotate is the exterior angle, not the interior angle, if you are trying to end up where you started. That was my point. I love that we think alike!!! I’m a tad out of the SAT loop the last decade, as Michigan went to requiring the ACT and fewer and fewer students asked for SAT tutoring. Only the evil geniuses at ETS/CEEB know what the future holds for the SAT, but back when I was regularly looking at such tests, there would be problems at the high end of difficulty that involved finding sums of angles where it was impossible to know the measure of any individual angle. Many of the drawings you’ve offered up (funny, but I always thought of that as triangulating, not dissecting; maybe I had a bad experience with pithed frogs at some point) remind me of those problems: add a bunch of these things (e.g., triangles) and subtract a bunch of angles that together form one or more of these things (e.g., straight lines, circles), and voila! you’ve got the sum you’re looking for. 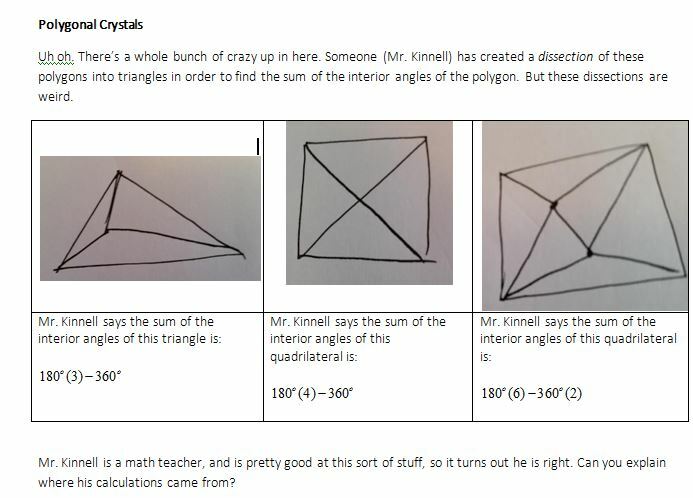 A major difference here is that at least in theory, we already *know* the sum we’re looking for, and the issue is seeing that if you just “add” triangles to create new figures, you can’t just keep summing the angles. If you do, you’re “double counting” some of the angles or something like that, hence the need to subtract some of the angles. It’s easy to imagine how confusing this can be for kids (or adults) just starting to wrap their heads around some of the ideas. 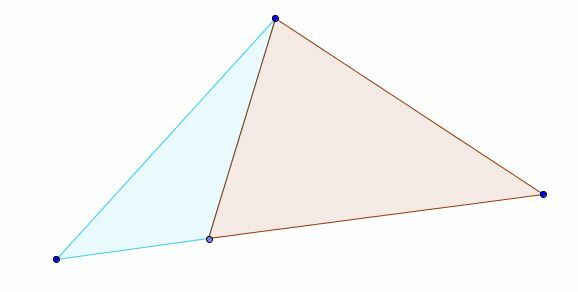 What exactly is an “interior angle” in a polygon? Without thinking about it too much or attending closely to definitions, there’s no reason not to think that some or all of those angles formed at interior intersections in those figures are to be included in the sum of the interior angles for the enclosing figure, rather than only summing the measures of the angles at the vertices of that figure. This exercise strikes me as excellent for pushing that issue to a kind of crisis point for students. Bravo! I love that phrase “crisis point.” I think that precisely describes what was happening here! Thank you for your thoughts! You’re welcome. Wouldn’t it be lovely if we could design and collect bunches of crisis-point problems that were known to be effective for pushing student thinking to cognitive breakthroughs?